Improvements to Action "Add separation names"
Improvements to Action "Replace page content by bitmap"
Improvements to Action "Rasterize page content keeping text"
Page Box variables added to the Action "Add object"
Paxe Box variables added to the Global Change "Add variable text"
PitStop 12 update 3 will officially support the newest OS X version. This new Action automatically generates a color bar using the document colors of each individual page. The user has the ability to set the tint values for the patches. They can also set the size of the patches to ensure they are large enough should they need to be measured by a densitometer. The user can also choose if the patches should repeat once or across the page, and there are also options to not add CMYK or colors that are 0%. The postion of the color bar is defined in relation to a PDF page box with an offset value and a position of top, bottom left and right. Below you can see an example of the color bar generated by the above settings. You can see the color bar automatically repeats. The start and finish point of the color bar is dependent on the page box used to define the position of the color bar. A request from a surprising amount of customers. Based on selected object(s) you can change the stroke of the object to match the fill or vice versa. A new Action following on from ‘Flatten form fields’ that we released in an earlier PitStop 12 version. This new Action has no configurable options, it just flattens Annotations so they become normal objects within the PDF. We often get support cases and see examples on forums where annotations cause issues on output, so this new Action is a welcome addition. 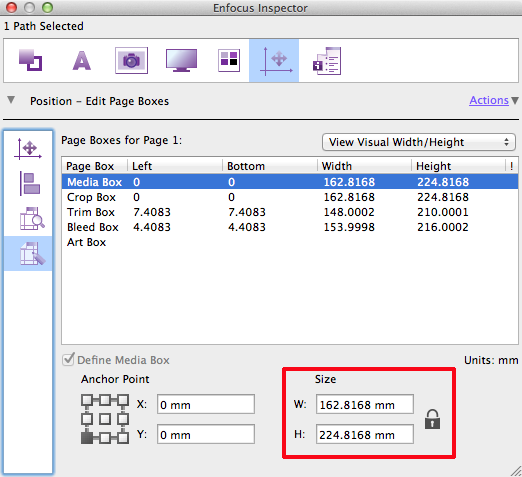 There is now a proportional ‘lock’ in the Inspector which can be used for proportionally resizing objects or page boxes. You will notice in this version that we have added a lot of new functionality related to working with layers in PDF files and also changed a lot of the existing layer functionality. One of the biggest changes is that there are now Actions that enable you to select layers in various ways. This means that older Actions that worked on layers have been changed so they can use the new functionality. These are all noted in this document. To make this transition easier the older style Actions are still available in existing Action Lists, but they cannot be selected any more when creating new Action Lists. This new Action is one of several we release in this version related to layers or Optional Content Groups (OCGs) to give them their official name. 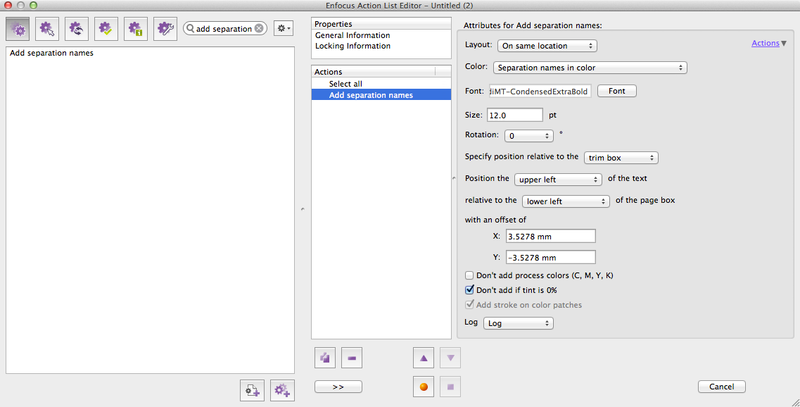 This first Action allows you to select one or more layers by name. It also has the option of working with Regular Expressions and Smart Preflight. This new Action selects all layers in a PDF document. It does not have any configurable options. This Action allows you to rename a layer(s). The Action can work with names, but in addition Regular Expressions and Smart Preflight can also be used. 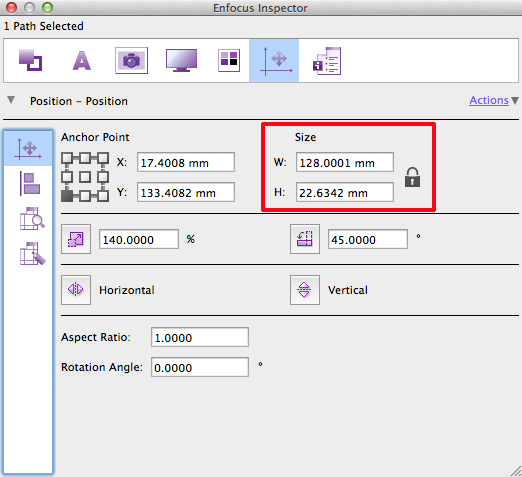 ‘Flatten layers’ now needs to be preceded by a select Action to define which layers need to be flattened. This could be all of the layers (Select layers Action) or it could be certain named layers (Select layers by name) or any of the other layer selections available. This Action needs to be preceded by a select Action to select the objects that are to be changed, Flatten objects in layer then removes those objects from all layers and removes any empty layers while respecting the options relating to the view of the PDF file. ‘Add objects to layer’ now has a different behavior. It now needs to be preceded by two select Actions. The first selection needs to define the layer(s) that the objects will be added to, the second selection needs to select the objects to be added, then the ‘Add objects to layer’ needs to be used. This Action needs to be preceded by a select Action to select the objects that are to be changed. The ‘Add objects to layer with name’ can then be used. If a layer does not exist with the specified name, then one will be automatically created. This Action needs to be preceded two select Actions. The second action needs to define the objects to be removed and the first Action defines the layers they will be removed from. This new Action checks and reports if there are any empty layers in the PDF. You can use it to check if there are an empty layers in the PDF, or if you wish to check if a specific layer is empty (dieline, cutter guide or bar code for example) you can easily do this by using a ‘Select layer’ Action before it within the Action List. This Action now needs to be preceded by a select Action(s) to define which empty layer(s) it needs to remove. 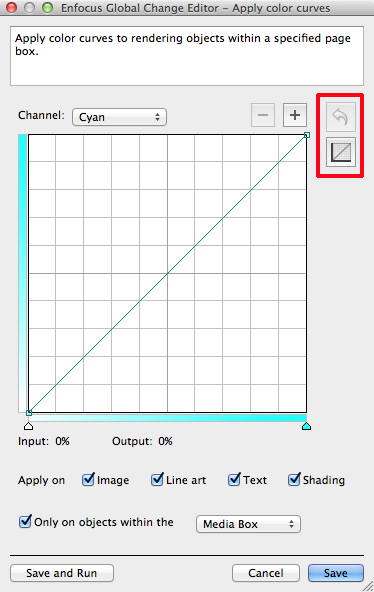 If a layer is selected that is not empty then nothing will happen. If all layers are selected then all empty layers will be removed and layers with content on them will be untouched. This Action now needs to be preceded by a select Action(s) to define which layer(s) it needs to check. This Action now needs to be preceded by a select Action(s) to define which layer(s) it needs to change. Mapping from Gray to CMYK has been improved, when you now map to CMYK you are shown a user interface that enables you to define the 100% CMYK color to be mapped to. Previously you would have seen just a CMYK definition of the Grayscale image. This Action, which we added in PitStop 12 update 2 gains a new feature to have all the separation names in the same location, so they overprint each other. The Action to ‘Rasterize page content keeping text’ has also been improved, both the rasterize Actions have been aligned in their functionality so this Action also gains an overprint option and a target colorspace option. This applies to the Action ‘Add object’. 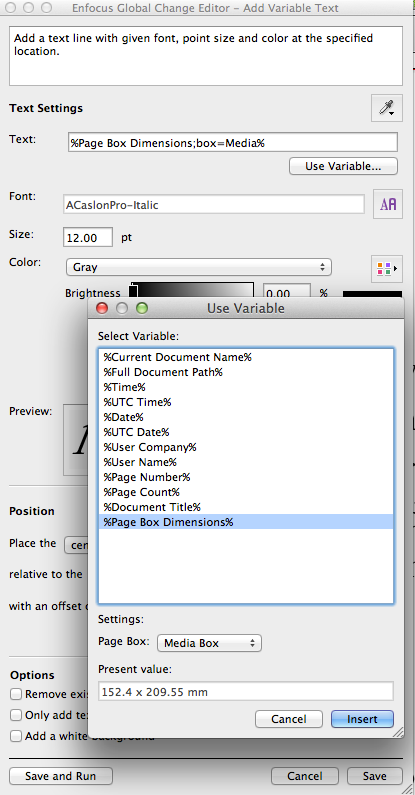 When you add text to the PDF you now have the option of a new variable ‘Page Box Dimensions’. This allows you to add the size (width + height) of one of the PDF page boxes (Trim, Bleed, Media, Art and Crop) in the file as a line of text. The unit value set up in your PitStop preferences in used when displaying the size of the defined box. This new feature has been requested by various customers who want to add the Trim size of the job to the file as part of their quality control process. This Global Change was introduced in PitStop 12 update 2. We have improved it by adding a couple of reset options that remove any existing curves or existing channels. This simple addition means that you no longer have to manually remove any previous settings, this was a little frustrating if you had to do it a few times. There is a new version of the Adobe Transparency flattener in PitStop Server, this fixed several bugs that had been reported. For an overview of the bugs in question please refer to the list at the end of this document. 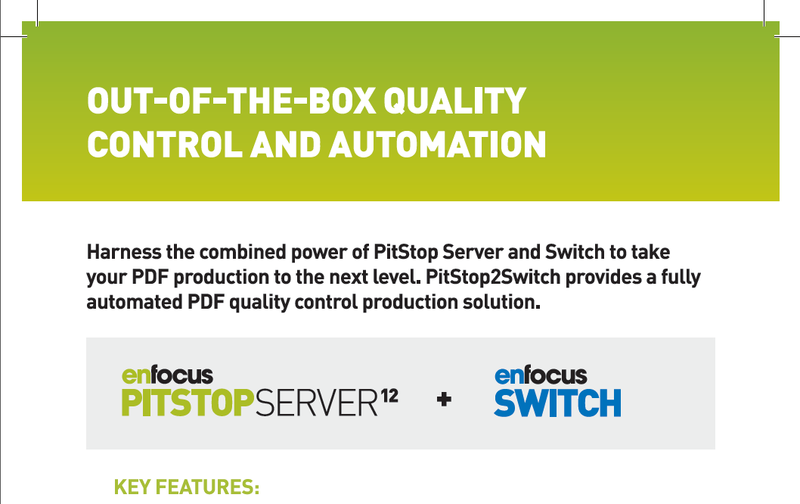 As with all versions of PitStop Server we now silently install a Switch configurator, this new configurator has several bug fixes and improvements over the previous version. We have added several new default Action Lists that use the new functionality added in this version. The following customer reported bugs have also been resolved with this update, if you reported one of these bugs it would be helpful if you could verify that it has been fixed on your system. 31499 PitStop Server How come Lab color conversion result is a visually lot different between CMMs? 24726 PitStop Server Problems viewing with Windows 8 Reader and Mac Preview? 31234 PitStop Library Better handle corrupted files which can be opened by Acrobat without a problem.